Two very wet days this week have curtailed some filming activities but there are still plenty of challenges around if you are prepared to put time in. A moorland plantation near Burnley provided fledged young Long Eared Owls which is a nice plus after those near Oldham have been taken. I would urge anyone reading this blog to keep a sharp look out for anyone with young Owls in captivity. Remember all captive birds must have rings on their legs that are registered with the authorities. To put it simply any without rings are held illegally and police should be informed. I spent two sessions filming young Kestrels being fed in a hole in the gable end of a rest home near Burnley. Three and a half hours on the 21st produced a feed every half an hour but none of the prey could be identified as it was passed to the young quickly and with their backs to the camera. A gale blowing today, twenty seconded, produced some wonderful views of Crossbills at Dovestones. Whilst the moving branches were a major problem at least it made the birds feed lower down and gave bigger images. After last weeks disappointment with egg collectors this week has been more rewarding and the weather has remained dry and sunny all week. Locally three different Whitethroat’s nests have been found and some great video of one pair with five young about to fledge. What a joy it is to film a species that feeds its young every few minutes rather than a three hour wait for a Merlin feed. Talking of Merlins I have had an unsuccessful attempt to film the male Merlin’s plucking post but this weeks picture shows I had better luck last year! – What an absolute gem he is. The highlight of the week has undoubtably been filming Green Woodpeckers with young about to fledge. Only the female fed the young at thirty minute intervals and one or two of the young would lean out of the hole to meet the female, calling loudly, it was all action and on one occasion a Great Spotted Woodpecker came to the hole but soon flew off when a young stabbed at it. All good things come to an end and after five weeks it was time to leave Islay. Five weeks of fantastic weather with only two days of rain and mostly clear and sunny. 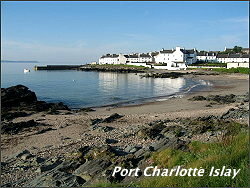 Perhaps the view of Port Charlotte bay will remind us of it? During the last week I filmed the Peregrine intensively with results usually proportionate to the time you put in. One morning I was rewarded with film never before seen let alone captured on camera. The male Peregrine brought prey to the cliff and called the female off the nest to take it off him as per usual. She returned to the three young and commenced the feed. Suddenly the male called from nearby and landed on the nesting ledge below the female. She ignored him and carried on feeding the young. 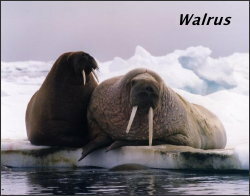 He walked up to her calling lowly and she tore off some prey and fed it to him! An unique event but more was to follow. After flying off he called again and returned to the female. This time he walked up to her and took the prey from her talons and flew off with it. I have not checked the video yet but it should all be captured on film – I hope! After five weeks of searching we finally found an Adder in the last few days. They used to be more common but Buzzards like them, so with the increase of Buzzards the Adder population has declined – much to the delight of most people. It was always going to be an anticlimax when we returned home and the first two days have proved this. 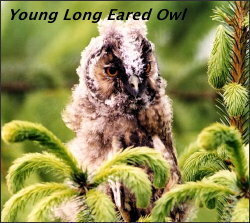 One pair of Long Eared Owls have fledged young but the other site has failed. 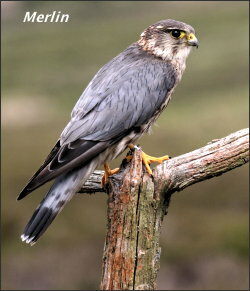 Worse was to follow with two Merlin sites failing, one a direct result of its eggs being taken by an egg collector. So my message for all you out there is that if you find the nest of a rare bird tell only the County Recorder as egg collectors are still sadly with us.- Lets hope its better news next week.